We hear how important audio mastering is, but why? For any artist or label looking to make a career out of music, mastering is essential. In short, it’s the final (and in many ways most crucial) step of music production…the stage where dull, lifeless tracks are transformed into polished masterpieces. Being a mastering engineer requires a special ear—one that can carefully analyze a recording and make delicate adjustments to bring it to its full potential. A skilled mastering engineer is the key to creating commercially successful recordings. On the other hand, a poor mastering engineer can be responsible for diminishing the work of a quality artist—for this reason working with a seasoned mastering specialist is a necessity. Think of mastering like cutting diamonds. Until a diamond is cut into shape, all it has is potential, and lots of it. The same is true for your music; until the right engineer polishes and finalizes your project, it’s only a fraction of what it could be. If your song’s not mastered, your song’s not finished. Period. These days recording studios are doing quick “masters” for bands, or even worse, bands are trying to handle mastering themselves. If you are serious about your music, you must look into your professional mastering options. Make sure your recording engineer knows to leave any limiting and compression off the master track when bouncing out…basically anything that would boost the volume.Tell him or her that you need rough natural-dynamic mixes for mastering. 3 or 4dbs of headroom is ideal. Then get a few samples done. This is the beauty of the present-day mastering industry. Options…and you can try before you buy. Pay close attention to customer service and turnaround times as well. Of course, we here Last Drop Mastering are one of these options, but we do want what’s best for your music, and if for some reason your vision for your music doesn’t quite line up with ours, we’ll be happy knowing that you’ll be getting what’s best for you. 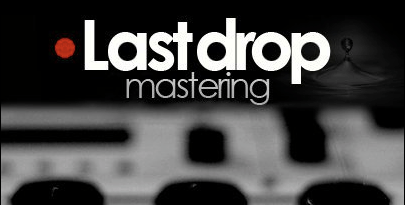 Last Drop Mastering has been helping artists, studios, and labels from around the world for over a decade. With “golden ears” and an efficient online process for submission and revision, professional mastering has never been easier. Recent clients include Cobra Starship’s Elisa Schwartz, American Idol star Jennifer Fuentes Hayward, and #1 itunes Reggae star Stick Figure.